Parker Shinn and Morrelli & Melvin introduce the ArgoX90, a unique concept designed to significantly reduce space launch and rocket component recovery costs. Rocket reusability has become the space industry’s focus to reduce cost. While SpaceX has landed boosters on drone ships hundreds of miles out to sea, expensive parts of a rocket have still proven unrecoverable. The ArgoX90 may change that. The recovery vessel is unparalleled in its maneuvering abilities, making it easy to position underneath rocket components descending by parachute. It is capable of sway (sideways) accelerations as great as 8.9m/s2 (almost 1 g) and has a top speed of 30 knots. The excellent maneuverability is due to the four-point configuration with 25ft individually rotating hulls connected by a 90ft x 90ft “X” frame. This innovation allows the vessel to achieve “sway” turns, whereby it can rapidly move in a lateral direction without having to turn the entire vessel. 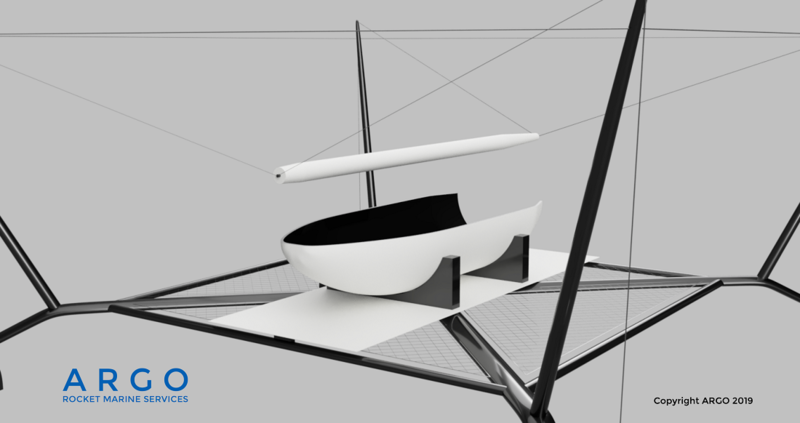 Instead of having to turn one or more long hulls of a conventional monohull or catamaran, the short individual hulls are far more maneuverable and can be rotated quickly and with less energy. 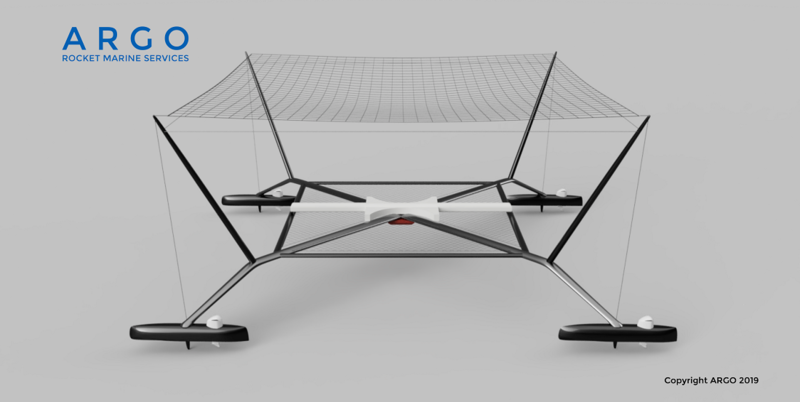 The design is also lightweight and minimalist, further contributing to performance and maneuverability. To rotate the hulls each of the four 300hp outboard motors are turned using a drive by wire control system. To perform a “sway” turn, where the platform orientation remains constant while the hulls rotate underneath it, all the motors are turned the same amount with the throttles remaining even. In a more traditional yaw turn the inside hulls are given a tighter turning radius while the outside hulls are given more throttle. Despite the unique look of the new vessel, Shinn and Morrelli & Melvin have worked to simplify the concept.